Only one Englishman has ever been Pope. That was Nicholas Breakspear, who was elected in 1154 as Pope Adrian IV. His exact origins are unknown, but he was probably born around 1100, his most likely birthplace being not far from St Albans, where he was educated at the Abbey school. He travelled to southern France, where he entered the monastery of St Ruf near Avignon and eventually became its abbot. 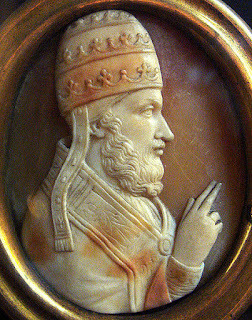 Pope Eugenius III elevated him to the status of cardinal and sent him to Scandinavia as papal legate. He was clearly successful in his mission to reorganise the Church in that region, leading to his election as Pope, in succession to Anastasius IV, in 1154. His first concern as Pope was to defend the Papacy against Arnold of Brescia, a monk and would-be reformer who had caused problems for previous Popes through his support for the “Commune of Rome”, which was an attempt to govern the city on Republican lines. The Commune had managed to have Pope Eugenius III (predecessor of Anastasius) exiled from the city, and Arnold was still a thorn in the flesh of the Papacy. With the support of the Holy Roman Emperor Frederick Barbarossa, Adrian was able to have Arnold arrested and executed. The next problem was an invasion of southern Italy in 1155 by Manuel Comnenus, the Emperor of Byzantium. Adrian saw this less as a threat than an opportunity to establish friendly relations with Constantinople with a view to ending the “Great Schism” that had split the Eastern and Western Churches since 1054. An alliance was engineered to fight against the Norman rulers of Sicily, but this ended when Manuel was summoned back to Constantinople. Adrian’s terms for repairing the Schism also proved to be unacceptable to the Eastern Church. Also in 1155, it is traditionally believed that Adrian issued a papal bull entitled “Laudabiliter” that conferred on King Henry II of England the right to rule over Ireland, a right that was retained by successive monarchs of England. However, no copy of this bull has been preserved and it has been doubted whether it ever existed. Frederick Barbarossa’s relations with Pope Adrian later took a turn for the worse, especially after a letter from Adrian was interpreted as meaning that he regarded Frederick as his vassal, although this might well have been a misunderstanding. This led to Frederick taking troops into northern Italy in 1158, and his capture of Milan. However, Frederick’s argument with the Papacy was put on hold in September 1159 when Adrian died suddenly. One story was that he choked on a fly in a glass of wine, although this is unlikely. No other Englishman has even become Pope, although Cardinal Pole came close in 1549, falling short by only two votes in the Papal Conclave. Anne of Cleves, King Henry VIII's "Flanders Mare"
Subutai, a ruthless "dog of war"